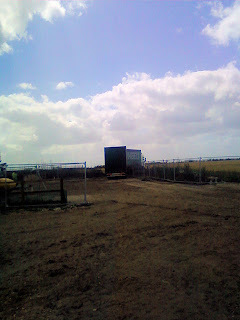 It seems quite a while since the first HBA lorry arrived (ref: http://blog.lofar-uk.org/2010/06/first-hba-tiles-arrive-in-chilbolton.html) but eventually on 16th July 2010 the last of them departed, loaded with pallets to be returned for the next HBA deployment on the international LOFAR project. Caption 1: The last lorry leaves the construction compound for its journey back to the Netherlands. Caption 2 : With the narrow country roads and single-lane tracks, it would be all too easy to forget a few things that are second nature to the locals. 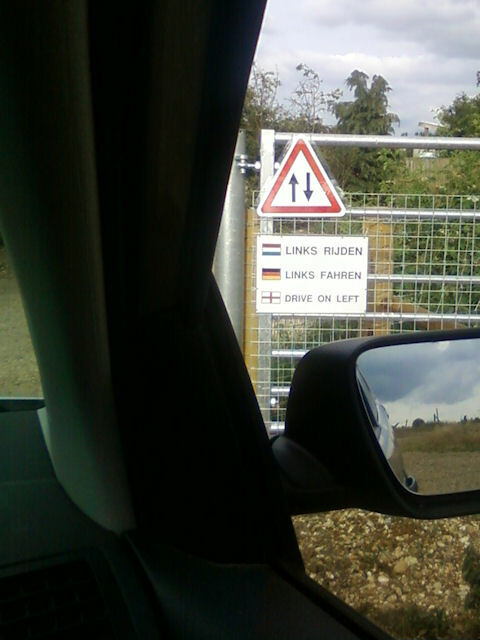 This little reminder was placed on the final gate for all the international installation crews and delivery lorries to see on their way out (it says "Drive on Left").